Memorial Park – what are the Council’s plans? For many months there has been growing confusion about the Council’s intentions for Memorial Park (sometimes known as St Marks Park). 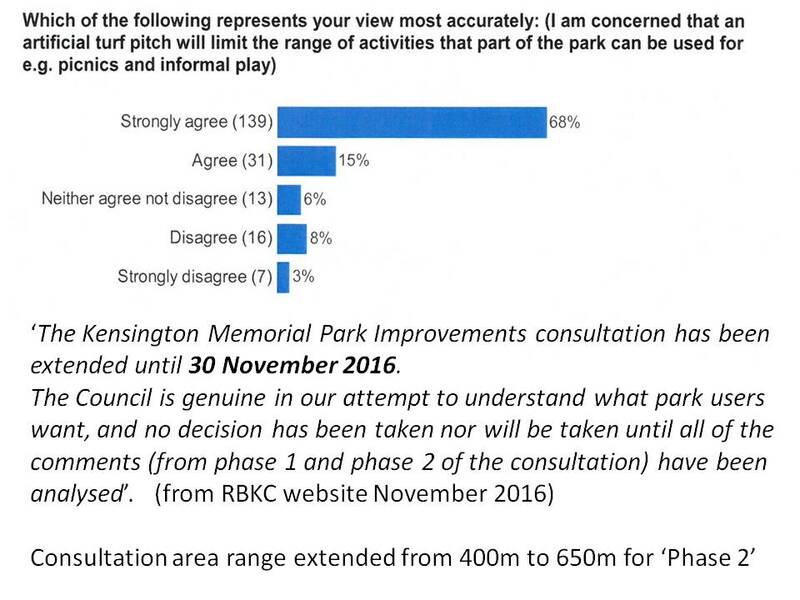 During the summer RBKC carried out a consultation, in the form of a questionnaire on possible ‘improvements’ to the park. Many felt that the questionnaire was weighted towards the idea of installing an all-weather floodlit football pitch (i.e. with an artificial surface) in place of the current grassed football pitch on the west side of the park. This area is used by the Kensington Dragons youth team at weekends and for informal games, dog-walking, and picnics in the summer. As part of a S106 planning agreement between RBKC and the developers of Argyll Place in Pangbourne Avenue, the sum of £150,000 was set aside before the development was built, for improvements to the park. The first item on the list in this legal agreement is refurbishment of the grassed pitch, which needs better drainage. The Council had 214 responses to the survey, and has analysed these. The results are shown below (in one of several slides that will be shown at the SHRA/StQW open meeting on November 24th). The was a strong majority against the idea of an artificial pitch. Subsequent to seeing these results, Cabinet member Cllr Tim Ahern asked that the consultation exercise be extended into a second phase, with further postcards delivered to residents in a wider radius from the park (650m rather than the original 400m). This ‘phase 2′ of the consultation ends on November 30th. The survey form remains available on the RBKC website at this link. The website now has a note asking people not to return a second response if they did so in the first consultation. This was not clear at the start of ‘Phase 2′. 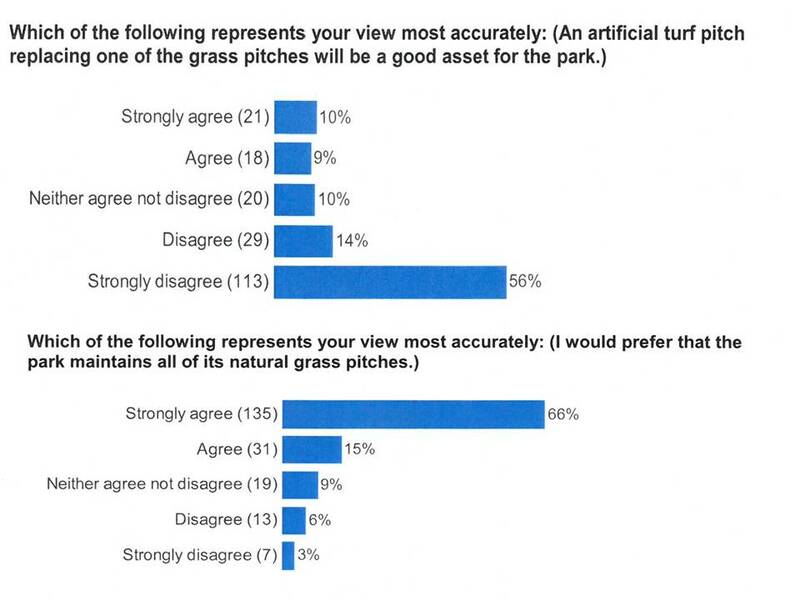 When discussed at the open meeting of St Helens Residents Association/StQW Forum on 9th June 2016, the clear majority view was that a floodlit artificial pitch is not what local people want to see in the park. There are obvious issues of noise and light pollution for immediate neighbours. For other visitors, the high wire fencing would detract from the views of what has always been an extensive grassed open space. Use of this part of the park becomes limited to a single activity, in what has always been a family park oriented park with its regular dog walking community. All weather pitches are already available at Westway. 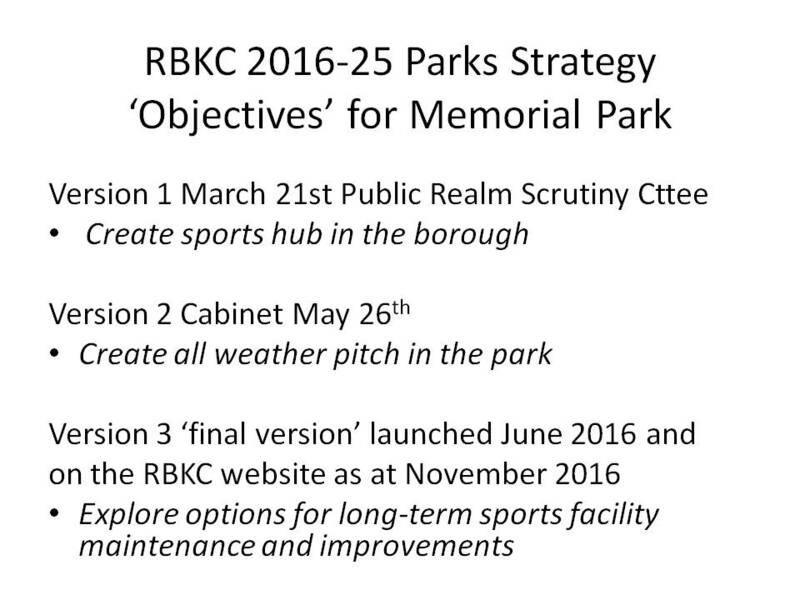 We have been assured by RBKC officers that the third set of wording above is that included in the ‘final’ version of the Parks Strategy, and that no Council decision on an all-weather pitch has yet been taken. But various exchanges between Pangbourne Avenue residents and Cllr Nick Paget-Brown (Council Leader) suggest that a decision has already been made. The Ask Nick session at St Helens Church on November 23rd may provide clarity. 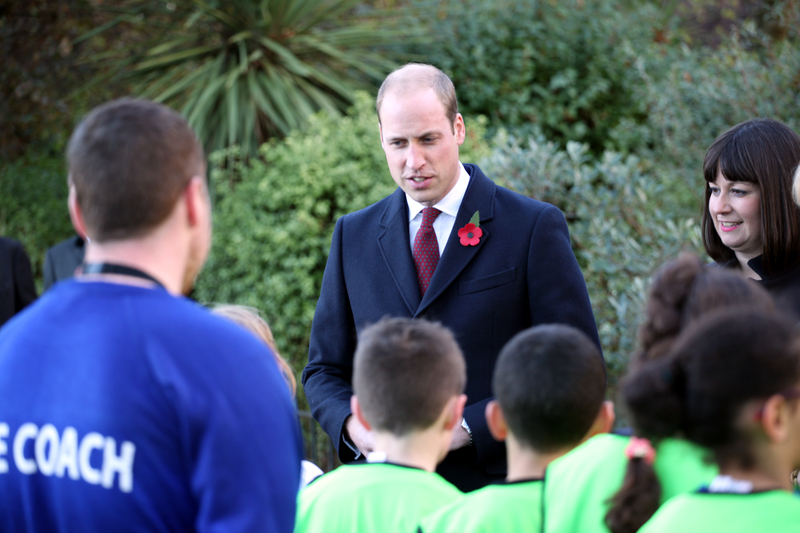 Meanwhile, Prince William came to Memorial Park prior to Remembrance Sunday, to designate the park as a Centenary Field. These designations were introduced recently as part of the First World War commemorations, in a programme organised by Fields In Trust. The designation will give added protection to the park as open space. As far as we can make out, it does no affect whether part of the park becomes an all-weather pitch. If the Council were to proceed with such a proposal, aspects such as floodlighting and fencing would need planning permission. Public consultation on a planning application would also be required. We hope that matters will not reach this stage, and that the Council decides without further delay to use the £150,000 sum already secured through a planning agreements, to install better drainage and refurbish the existing grass pitch.